Nigerian President Muhammadu Buhari has responded to criticism from his wife by saying she belongs in his kitchen. Mr Buhari was standing next to Chancellor Angela Merkel, who seemed to glare at him. Aisha Buhari had said she might not back her husband at the next election unless he got a grip on his government. Responding to questions by reporters, Mr Buhari said that having run for president three times and having succeeded at the fourth attempt, he could “claim superior knowledge over her”. 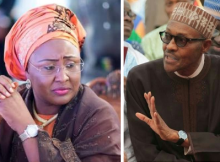 In an interview with the BBC’s Hausa language service, Mrs Buhari, a businesswoman and activist, suggested her husband’s government had been hijacked by only a “few people”, who were behind presidential appointments. “The president does not know 45 out of 50 of the people he appointed and I don’t know them either, despite being his wife of 27 years,” she said. Her decision to go public with her concerns will shock many people, but it shows the level of discontent with the president’s leadership, says the BBC’s Naziru Mikailu in the capital, Abuja. The president’s remarks on the kitchen and “the other room” have been met with outrage on social media. There was immediate criticism for the president’s thoughts on the role of women. Some are wondering what Mr Buhari meant by “the other room”, others have been posting pictures of a variety of bedrooms, and the hashtag #TheOtherRoom is trending in Nigeria.